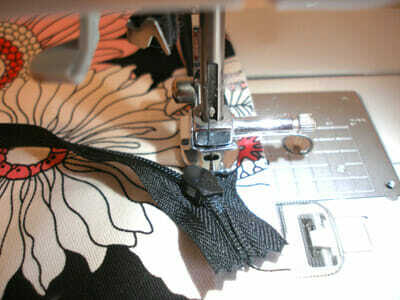 Many new sewers are intimidated by the thought of sewing zippers and especially the invisible zipper. But let me tell you a secret – the invisible zipper is the easiest one because no one will see if your stitches are a little bit wonky and it doesn't go perfectly for your first attempt! You can do it – let's give it a go. First – take some video training. I highly recommend that you watch the free online video course from Craftsy – Mastering Zipper Techniques. It's entirely free and the teacher is lovely. She shows you how to sew a regular zipper, an invisible zipper and a lapped zipper over the course of several short lessons. Watch them all, or just the ones you are interested in. 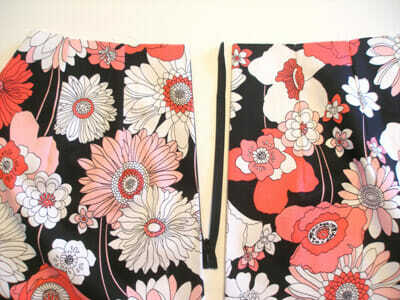 Then you will be well prepared when it comes to sewing your skirt zipper. The invisible zipper can be tricky to visualize because it goes in with the flat of the zipper tape facing outwards and the teeth of the zipper facing inwards towards the body. So sometimes its placement can be counter-intuitive. I suggest laying out your zip and fabric and just getting it straight in your mind how this is going to look when it's finished. On each of the back panels turn in your center back seam allowance (5/8th of an inch) on the top 12 inches and press with an iron to create a crease. 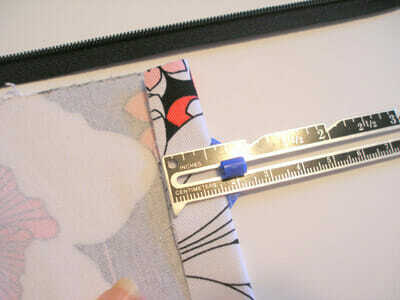 You can use one of these handy Sewing Gauge with the adjustable slide. Lay out your fabric as shown in the picture and place the zip in the center with the zipper teeth on the bottom and the zipper pull on the top. 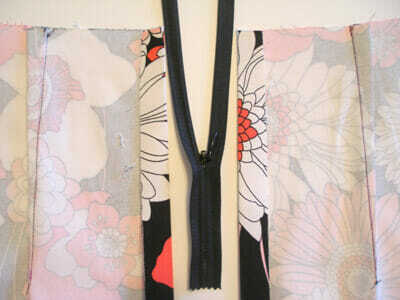 Open the flap on the right hand piece of fabric all the way over the zipper and pick up both together. 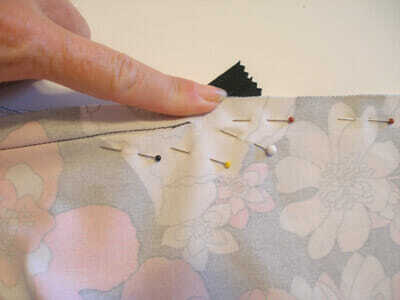 This is the way you are going to pin and sew them together. Turn the fabric right side up with the zipper on top. Then carefully line up the top of the zipper tape with the top edge of the fabric and line up the edge of the zipper teeth with the crease you created earlier. Pin in place from top to bottom. It should look like these photos. Switch to your invisible zipper foot or your adjustable zipper foot and make sure you line up the needle with the hole or notch in the zipper foot, testing it with the hand wheel. Position the zipper under the foot. Where you position the zipper will depend if you are using the invisible zipper foot or the adjustable foot. Watch the video series above if you need another look. Sew from the top, back stitching at the top to secure. 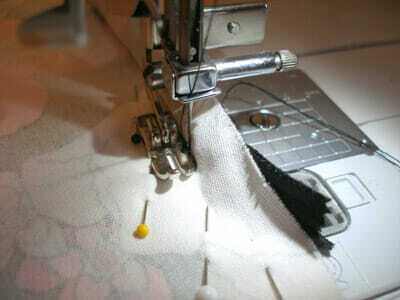 Keep sewing all the way to the bottom until you can't stitch any further and back stitch to secure. Go SLOWLY and make sure your stitches are pretty close to the zipper teeth. When you remove it from the machine and fold back the fabric at the crease, it should look something like this – with the zip hidden behind the fabric. The fabric on the right above is now to be sewn to the other side of the zip in the same way. 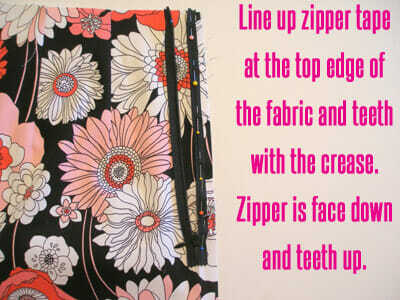 Line up the top of the zipper tape at the top edge, line up the zipper teeth with the crease at the center back. Pin and sew from top to bottom as before. It should now look like this on the inside. Do up the zipper and it should look like this on the outside. Congratulations – you just sewed a great looking invisible zipper! But we aren't finished yet because we need to sew that center back seam. If you have been using an invisible zipper foot, you will now need to change to a regular or adjustable zipper foot for that back seam. 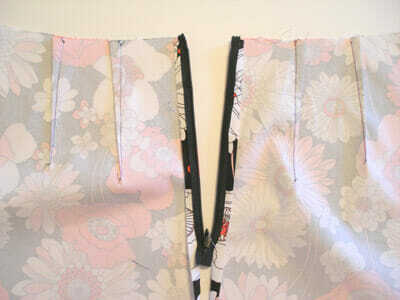 Do up the zipper and place the pieces together lining up the center back seam. 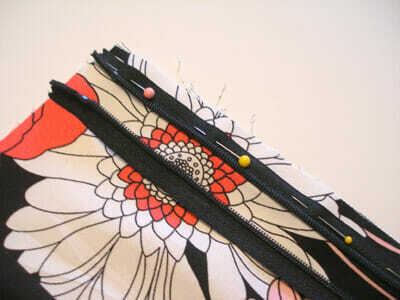 Pin carefully in place along the seam and especially around the bottom of the zipper to prevent the fabric moving. Make sure its nice and smooth here. 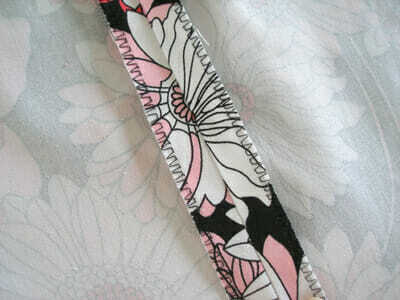 Here is a close up of the pinning at the bottom of the zipper. Pull the zipper tape out of the way. Take this to your sewing machine and you will want to start sewing as close as possible to the end of your previous line of stitching. Start a little before the last line ended to make sure you don't get any gap, stitch as close as you can until you are past the end of the zipper and then follow the usual 5/8th inch seam allowance to the bottom. Open out you skirt back and take a look. Is it nice and smooth at the bottom of the zip? It can take some practice to get it right just there. If you aren't happy, unpick, smooth out and repin and try sewing again. Once you are happy, press your center back seam open. Press on the outside to get a nice finish over the zipper but be careful not to melt those plastic teeth after you did such a good job! And your last step for today. Line up the side seams on the skirt back with the skirt front, right sides together. Pin in place and try on your skirt. 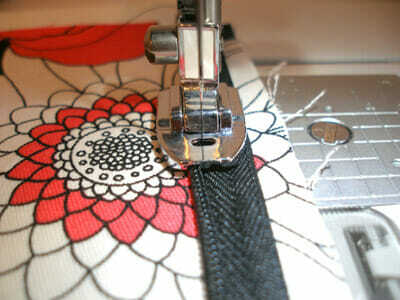 Make any small adjustments if necessary, mark any revised stitching line and then sew both side seams. Great – your skirt is now really starting to take shape. 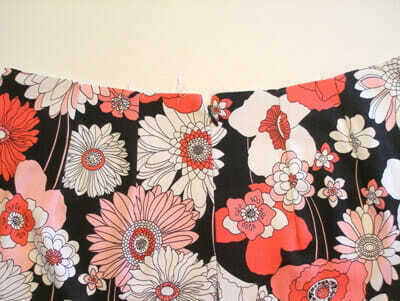 Join me soon for the next step in our Sew A Skirt series – Neaten your seams and adding the skirt lining. Never miss a post, and follow along with the Sew A Skirt tutorial series. I'll send all updates to your mailbox twice a week for you to keep and follow along at your own pace. 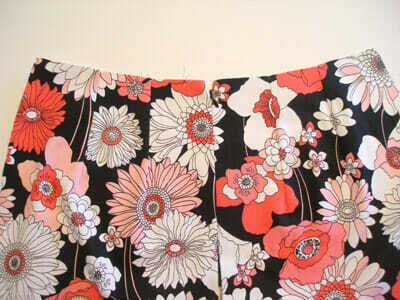 I'm really looking forward to seeing your skirt and featuring it on Sew So Easy! I promise, no spam. Just an email once or twice a week with the new posts. Tagged Sew a skirt series. Bookmark the permalink. Very helpful for our students. This is a great tutorial – thank you for giving me confidence to tackle my first clothing project! I have a question about the zipper though, how do I know how long my zipper should be? Great tutorial…I’ve bookmarked it for future reference. 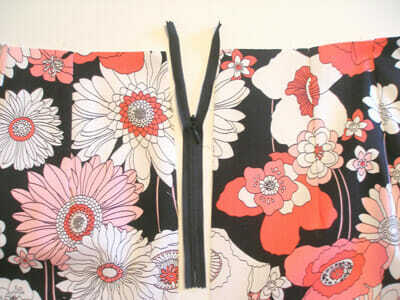 I sew a lot (a lot a lot), but I think I’ve done an invisible zipper only once. Somehow, it turned out…and when I was done, I couldn’t remember exactly how I’d gotten so lucky and oddly enough, have been nervous about trying it again! (zippers being one of my least favorite aspects of sewing). I’m encouraged and so glad you included not only your own photos and instructions, but a link as well. Sweet, now i can tackle that zipper, thanks! Pinning! Never thought I’d say this but I absolutely now wish I had a sewing machine. You’ve made this so darn simple. I love it! I have been trying to sew on and off for years. Right now it’s on, and I have a great pattern for a dress but I did not know how to put a zipper in. Thanks a million!!!! 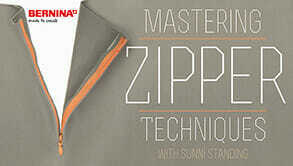 Great tutorial on an invisible zipper! I love them in my garments too! I just popped over to view your site – great linen pants. I have some RTW that I really must copy before they wear out and fall apart. Good to know about the linen tips for washing.